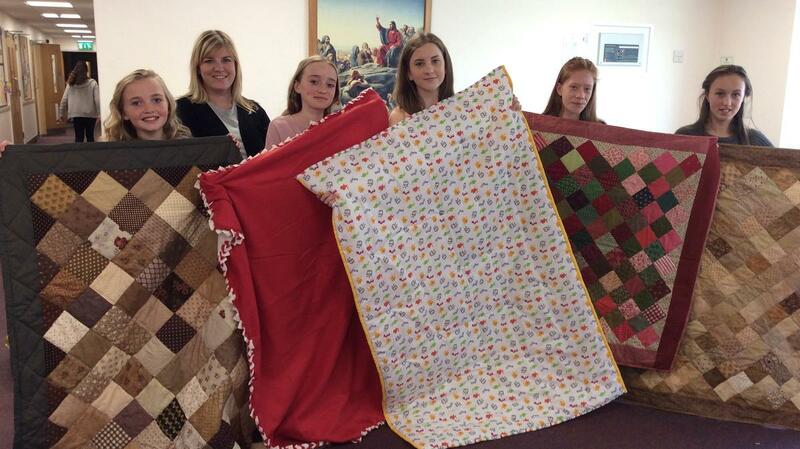 Since the start of the refugee crisis in Europe, members from the Hull stake of The Church of Jesus Christ of Latter-day Saints have fulfilled several projects to support the refugees, but it was in May of this year that Jemma Everitt, Relief Society President, felt inspired to appeal to local women to donate blankets for the same cause. The target was 100 blankets to be brought to a local meeting being held for females aged eight and older at the end of September 2017. Here, the sisters would also watch the General Women’s Conference session held the previous week in Salt Lake City and attend special creative workshops and discussion groups. Not only the mothers and older women in the group but also many of the young girls took up the challenge. Sewing, knitting and crocheting kept the women busy throughout the summer, with a firm determination to reach the goal that had been set them. At the meeting in September, bags full of quilts and blankets were brought in by loving hands that had been so busy. All counted, there were 272 items donated. A special workshop was set up to sew hearts on all the items collected, symbolic of the love sent to these people in need. Sisters in Hull were inspired, acted on their inspiration and saw how their effort helped bless the lives of refugees. Only four days before the women’s meeting was to be held, Sister Everitt received a phone call from Cath Edwards of Hull Help for Refugees. Sister Everitt was told a special appeal from Calais had gone out to refugee organisations informing them there was a desperate need for more blankets and asking if more could be donated from areas around the United Kingdom. Edwards was surprised when Jemma said she would have 100 quilts and blankets collected and ready to hand over by the end of the week. Edwards’s surprise later turned to amazement when she was told there was more than double the number she had been promised. Sister Everitt truly felt she had been inspired four months earlier to begin this project.